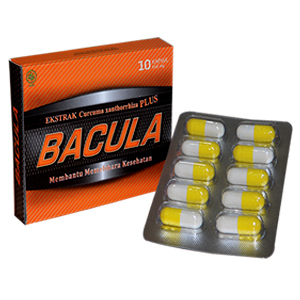 Bacula is a combination formula of several herbs (100% natural herbs), no preservatives and dyes as well as Medicinal Chemicals (BKO). Manufactured with standard CPOTB / GMP and has obtained the license number (NIE) from BPOM officially so the quality, efficacy and safety is assured. All raw materials will be extracted and mixed and in accordance with the formulation that has been tested, and put into the capsule. Has benefits as a hepatoprotective, traditionally have been used for a long time by the people of Papua. For those who are fond of drinking, it is advisable to consume Gami to prevent damage to the liver. For patients with hepatitis, then Gami very effective to help the healing of both Hepatitis, A, B and C. Maintaining healthy liver function for those who consume drugs (such as diabetes, hypertension, psychiatric disorders, tuberculosis, hormone drugs, etc.). Helps healing process especially degenerative diseases such as cancer, tumors, heart disease, stroke, diabetes, kidney disorders, the immune system, the optimization process of detoxification or removal of toxins in the body, absorption of nutrients, eliminates fatty liver and normalize blood levels of SGOT and SGPT. It is recommended to drink 2 glasses of water on an empty stomach ie 1 hour before eating or 2 hours after meals, to enhance absorption of the drug. atau pembuangan racun dalam tubuh, penyerapan nutrisi, menghilangkan fatty liver serta menormalkan kadar SGOT dan SPGT darah.